Posted April 23rd, 2017 by Mike Boyes & filed under Personality, Sensation-Perception. Description: Growing up I had a couple of friends who were always daring or challenging one another with feats of eating. “I bet I can eat 15 cheeseburgers in 1 hour. I bet I can finish this whole bag of puffed wheat cereal in 30 minutes”… and it went on and on. It stopped when one of the friends bet the other he could not eat, I think it came down to, 5 red chili peppers. The friend who accepted the bet ate all 5, turned bright red, threw up, and then rushed around for the next hour or so drinking water, milk, eating bread and panting, bug-eyed, that his “mouth was on fire! After that the dares stopped. I guess he had hit a tasting wall. Some people are happy to take the advice of blues musician Tim Williams telling us to “Put Some Peppers in Your Chili” (So Low Album, 2016, cayusemusic.com) while others run away when “heat food” is put on the table. So where are you in the mix? Do you like chili-hot food? Why do some people like it so much while other hate it? How does chili-hot relate to plain old hot? Well to find out read the article linked below. There is always more to learn about how our sensory system works! Source: Feel the Burn: why do we love chili? Bob Holmes, Food and Drink, The Observer. 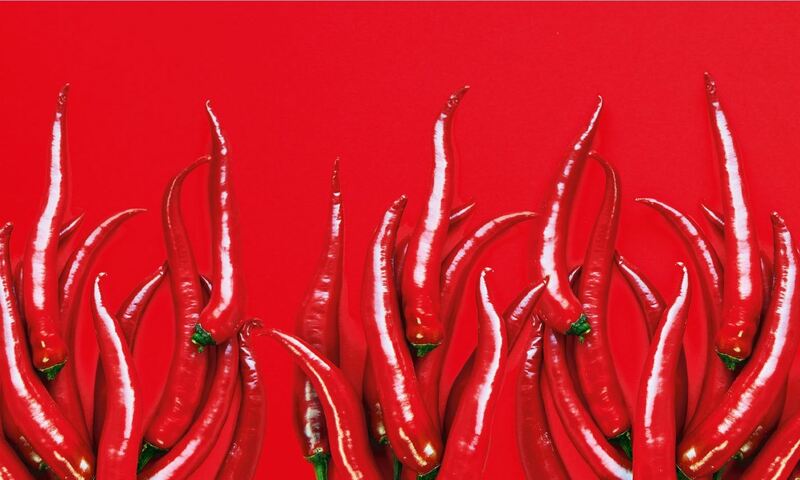 So perhaps you knew about capsaicin, the (seriously) active ingredient in chili that brings the heat. But, did you know that we have receptors (TRPV1 receptors) that respond to (and signal our brains about) the presence of chili heat in ways that are essentially identical to signaling about real or actual heat? 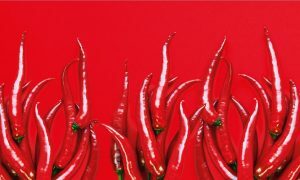 Chilies do not just seem hot they REALLY ARE hot and people that like them may be less sensitive to their effect OR they may actually enjoy the pain of chili heat. Chili, then, is NOT a taste so much as it is a sensation, of heat! I liked the Hungarian saying in the article that I had not heard before that “good paprika burns twice”. I was also impressed by the development of the Scoville scale, developed back in 1912 by Wilbur (yes) Scoville as a way of quantifying the heat in peppers. He simply tested how far, by volume you had to dilute a pepper to remove its burn. This useful (defensively at least) scale tells us that basic table pepper extract must be diluted 10 times to remove its heat while a Cubanelle pepper can range for 100 to 1000 Scoville units, a Jalapeno pepper can range from 2500 to 8000 units, and the deadly Carolina Reaper can range from 1.4 to 2.2 million (yes million) Scoville units (see the list here: www.pepperscale.com/hot-pepper-list ). So why do some people seek chili heat? Well personality is part of it. For women being a high sensation seeker is part of it while for men sensitivity to (social) reward is a higher motivator (read bragging rights or machismo). So now you know more about why you seek chili heat or, if you don’t, you have a LOT more snappy facts to talk about while trying to avoid the “how much heat can you stand” dinner competition! How do we process the sensation of heat in chili peppers? What individual difference dimensions contribute to people seeking and liking of, or their stanch avoidance of, chili charged foods? What sort of factors, other than our how our sensory systems are built are implicated in the liking or loathing of chili heat? Rozin, P., & Schiller, D. (1980). The nature and acquisition of a preference for chili pepper by humans. Motivation and emotion, 4(1), 77-101.